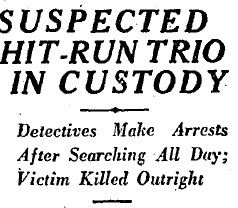 Detective Lieutenants Kallmeyer, Werne, and Roberts spent all day searching for the three contemptible men who cruelly drove away from a hit-and-run accident which left nineteen year old Aristo Santelanto of 712 Clara Street, dead at the scene. The hardworking Santelanto was with a crew of men repairing railway tracks at Washington Street and Cimarron Avenue when an automobile that was traveling at approximately sixty miles an hour struck him. Without slowing, the death car sped away. A sharp eyed witness to the crime furnished detectives with numbers from the car’s license plate. The investigation was complicated because the crime car had traded hands several times over a period of six months. Undeterred, the cops persisted in their search and as a result, A.T. House, 32, of Lankershim (now North Hollywood), was handcuffed and taken into custody for suspicion of manslaughter. House’s passengers, Eugene Long, 20, and Paul Post, 32, both of Lankershim, were picked up by police at Sunset Boulevard and Wilcox Street, where they were employed. The two men were taken to the City Jail and charged with failure to render aid.